In the late summer, most of the vegetation growth is in the high canopy of Three Cornered Copse. The sunlight struggles to reach the forest floor, and the grey and green vegetation dies back, giving the inside of the copse its distinctly “ragged” appearance at this time of year. But in these days a different type of growth is happening. 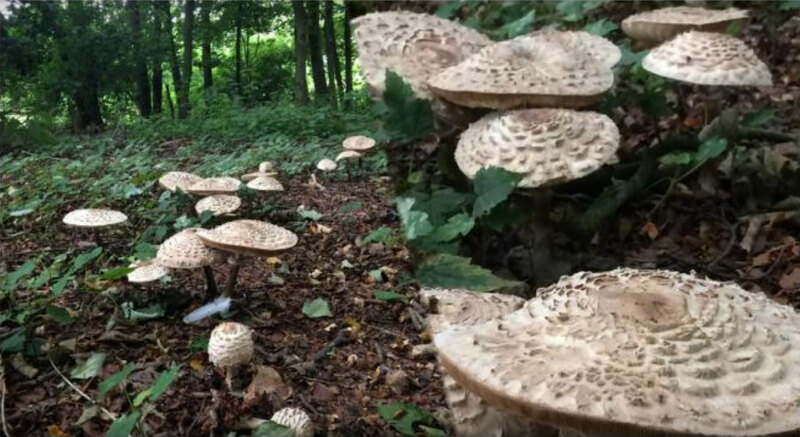 The photograph shows a clutch of the Parasol Mushroom (we think!) found in the copse at the base of the trees in the northern edge of the wood. Apparently this species is quite edible, and has a sweet taste, used in its own recipe of Parasol Schnitzel. However, given that 20% of species are poisonous, we left them growing, for a more confident mycologist to forage. We also spotted some Puffball mushrooms. Incidentally, only 1% of fungus species are deadly, and another 1% are psychoactive, that is, hallucinogenic. Another fungus fact: mushrooms and toadstools are indistinct in definition. People can call the same species either name, however I would suspect supermarkets would struggle to sell a food item labelled as a “toadstool”. 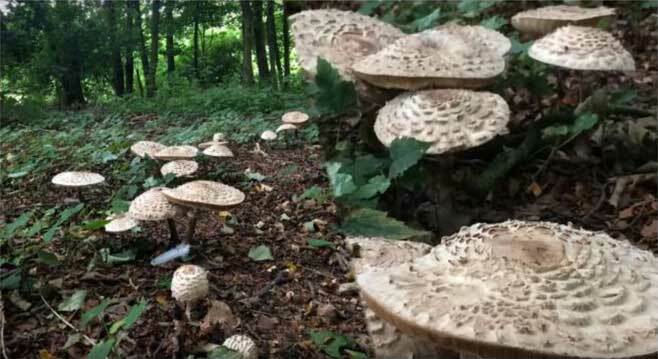 The parasol structures are of course only the fruiting body of the fungus which has a mycelial network under the floor of the forest, breaking down the rotting vegetation that is buried each season. They last only one or two days, before releasing their spores (around a trillion of them) and dying back. Garry, our park ranger, has been busy lately and installed a removable bollard at the south of the lane leading into the copse from Goldstone Crescent. Earlier in the year, contractors were using the lane for access to the gardens which back onto the lane, and we had several concerns raised about safety while they operated there. The lane is technically a public bridleway, which only allows walkers, horse riders and pedal cyclists to use it, and all motorised traffic is prohibited. The bridleway follows up through the copse and hugs the fence on the west side. At one time this was a regular path for horses trekking up to the Downs from the stables in Goldstone Valley. The bollard will ensure that only council-approved access will be possible. We have another work day coming up on 16 September, plenty to do after the busy summer. All welcome, as usual. There may even be time to do more foraging for mushrooms.